The biggest hotspot by far, is Ukraine with 53,218 reported cases in 2018, followed by Serbia with 5,076, Israel with 2,919, France with 2,913 and Italy with 2,517. This surge in measles cases last year coincided with more children than ever before receiving their full two-dose vaccination in 2017, showing an estimated 90 per cent immunization coverage - the highest since records began in 2000. Coverage with just the first dose of the vaccine also increased slightly to 95 per cent, the highest level since 2013. 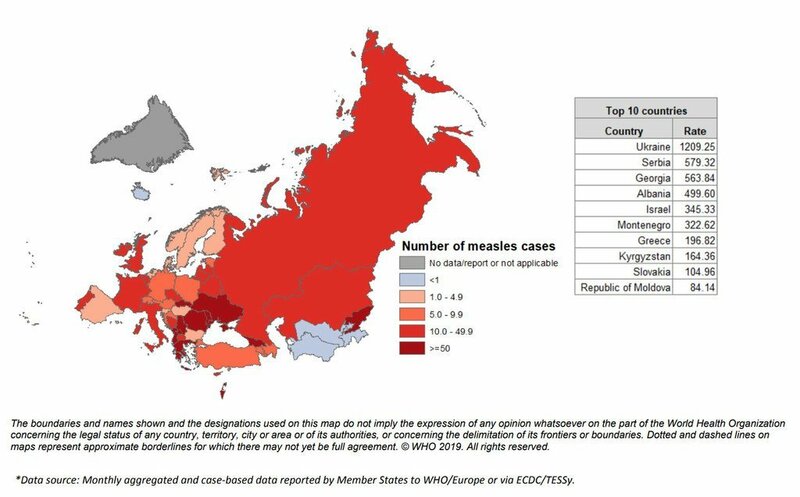 Forty-three European countries interrupted transmission of endemic measles for at least 12 months as of the end of 2017, showing that elimination of the disease is well within reach for the whole region. WHO explained that this seeming contradiction between the record numbers of those being protected, as well as contracting the disease, can be explained by the fact that vaccination rates nationally, are not matched by major immunization gaps at a regional and local level. “The picture for 2018 makes it clear that the current pace of progress in raising immunization rates will be insufficient to stop measles circulation,” said Dr. Zsuzsanna Jakab, Director of WHO’s Regional Office for Europe. “While data indicate exceptionally high immunization coverage at regional level, they also reflect a record number affected and killed by the disease”. “Progress in achieving high national coverage is commendable,” added Dr. Nedret Emiroglu, who heads the Division of Health Emergencies and Communicable Diseases for WHO Europe. “However, it cannot make us blind to the people and places that are still being missed. It is here that we must now concentrate increased efforts. We should never become complacent about our successes but continue to strive to reach the final mile. Together we can make this happen,” he stressed. To prevent outbreaks and eliminate measles, WHO says countries need to sustain at least 95 per cent of national and sub-national immunization coverage with two doses of measles vaccine, as well as identify and target all pockets of under-immunization among their populations. This will ensure protection for everyone – including babies too young to be vaccinated and others who cannot be immunized due to existing diseases and medical conditions. WHO has developed a European Vaccine Action Plan for 2015 to 2020, which lays out a strategy endorsed by all the region’s 53 Member States to eliminate both measles and rubella.